This weekend, the VHS Speech and Debate Team finished the 2018-19 season with a roar at the GA Southern Peach District Nationals Qualifying Tournament. 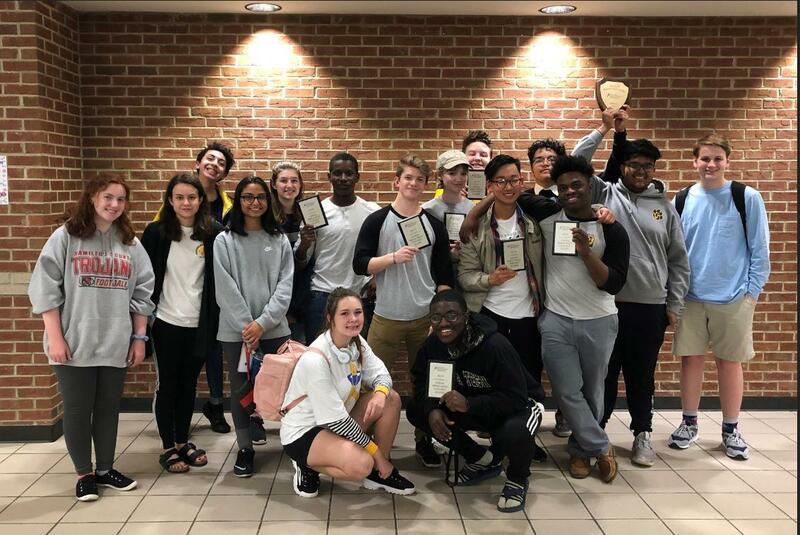 The Team qualified eight students with first and second place bids and six additional students as alternates to compete this summer at the NSDA National Speech and Debate Tournament in Dallas, TX. The team also has several students who have been nominated to represent GA on the all-district World Schools Debate Team. The GA Southern Peach District is composed of teams from all over Georgia and annually qualifies around 40 students to compete at the National Tournament in 14 different mainstage Speech and Debate events. Several of the adults who work with the team were also honored at the Tournament and will be advancing on to win national honors. Debate parent and volunteer, Leigh Touchton, represents the district as Volunteer of the Year. Ms. Touchton’s assistance to the team goes beyond what is expected of a parent. Ms. Touchton accompanied the District to Nationals last spring and transported district members to their various competition sites. She has recruited numerous community judges to judge at the team’s annual tournaments, the district tournament, and, this year, the GFCA State Championships. Assistant Coach Brianna Crockett was honored as the Assistant Coach of the Year for the District. Coach Brii is in her third year as an assistant coach for the team and an alumni of the program. Brianna is a junior English Education major at VSU. Brianna works countless hours coaching the team and traveling to tournaments. VHS Principal Janice Richardson was honored as Principal of the Year. Dr. Richardson is honored for her efforts not just in the founding of the VHS team six years ago but also for her promotion of Speech and Debate throughout South GA. Dr. Richardson has encouraged the VHS coach, Pamela Childress to serve on the State and District leadership teams and to allow other coaches to come into VHS to observe the Debate/Forensics classes and team practices. She has encouraged Ms. Childress to assist new teams around GEorgia and Florida. These efforts to encourage the growth of Speech and debate helps all students in our state to develop the critical thinking, reading, writing, and speaking skills to be successful in both college and career. Dr. Richardson leads the state in recognizing the need for these “soft” skills. This is the first year that She was eligible for the award and leaders in Speech and Debate in Georgia and around the country encouraged her nomination. Additionally, the team was honored with the Speech Sweepstakes Award which honored the whole team for their group efforts.